•et; Place your hands on a wall at shoulder level. 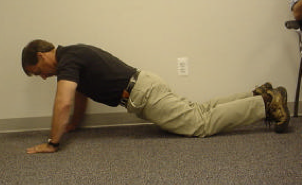 •et; Lean against the wall and perform a push-up against the wall. you may move on to step 2.
making sure to keep your knees on the ground. •et; Slowly perform a push-up in this position. you may move on to step 3.
and slowly perform a push- up. low weight and progress to heavier weights. Place your hands on a wall at shoul- der level. 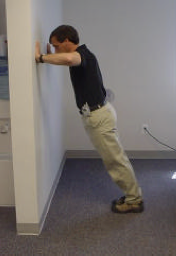 Lean against the wall and perform a push-up against the wall. Once you can tolerate 25 of these pain free, you may move on to step 2. Situate yourself in the push-up position, making sure to keep your knees on the ground. Slowly perform a push-up in this position. 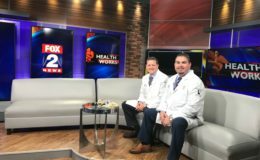 Once you can tolerate 25 of these pain free, you may move on to step 3. 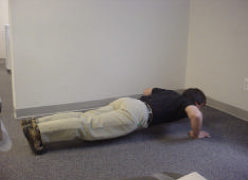 Situate yourself in the push- up position on the floor, and slowly perform a push- up. Once you can tolerate 25 of these pain free, you may begin to bench press, starting with a low weight and progress to heavier weights.